(On TV, April 2017) The trouble in watching some older well-known movies is realizing that while they were immensely popular in their time, they are nearly empty of anything interesting beyond their premise. 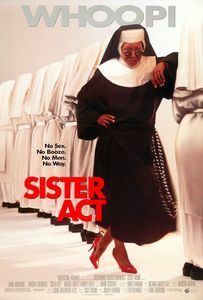 (This is usually more obvious in older movies—for all of our complaining about newer films and how they all come down an assembly line, they can now depend on a wider variety of plotting clichés) So it is that Sister Act is purely formula-driven film, with easily predictable plot developments, a simple narrative arc and easily-digestible characters. After fifteen minutes, the film settles down into an incredibly familiar rhythm that it never escapes afterward. Whoopie Goldberg stars as a disreputable lounge singer who witnesses a murder and had to go in hiding at a convent. Her fallen persona makes for easy fish-out-of-water gags, but you can bet your three-act structure that they will all learn something from each other by the end of the story. Executed with all of the obviousness of early-nineties mainstream comedies, Sister Act makes sure to underlines every one of its jokes three times to make sure we haven’t missed any. It quickly becomes tedious. Goldberg is quite good in the lead role, but the film around her isn’t interested in wit or subtlety.